Cash rent is often the single largest expense item in a crop budget, making its level critical to the profitability of farming operations. During the farm sector’s economic slowdown, rents have been persistently high, greatly contributing to the profit squeeze. It now appears that they are heading lower. For instance, Dr. Craig Dobbins reported that a February poll of Indiana farm managers and rural appraisers found expectations that 2016 cash rents would be down about 8% in 2016. If realized, a decline of that magnitude would be one of the largest since the 1980s. Given the importance of rents to profitability we decided that it would be useful to examine some historical data on cash rents and examine whether these declines are likely to be sufficient to return farms to profitability. Purdue’s estimates of changes in cash rental rates for average quality Indiana farmland are shown in Figure 1. Here, one can see that land rents rarely change by more than a few percentage points a year. However, it is absolutely important to remember that these are average rates across the state. Individual leases can exhibit much greater changes and much higher or lower rates. Figure 1. 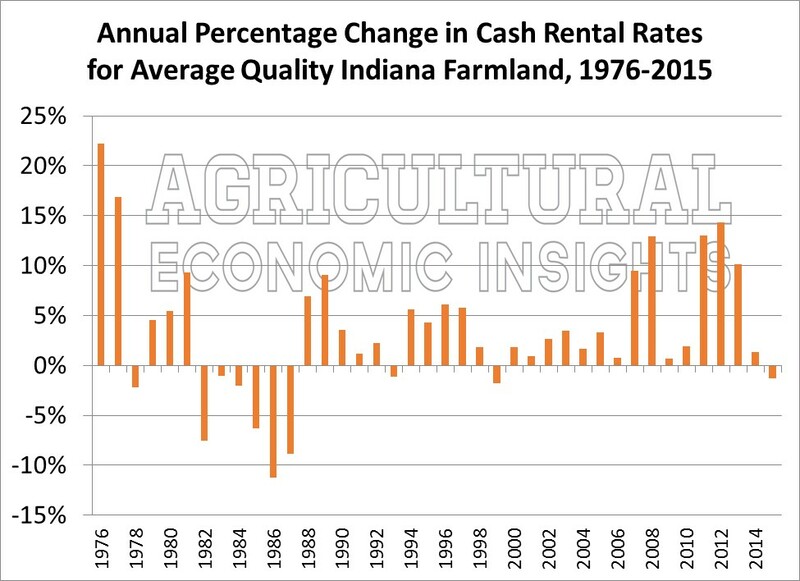 Percent Change in Cash Rent for Average Quality Indiana Farmland, 1976-2015. Source Purdue Farmland Value Survey. The 2015 decline in cash rents is notable not for its size (1%), but because it is the first meaningful decline notched since 1999. Since 1976, these data indicate that average cash rents have declined 10 years, or 25% of the time. Aside from the 1980’s the declines have all been rather small. Since 1988, cash rents have declined only 3 times and all of the declines were less than 2%. Instead, rents generally increased. Most times, these increases were less than 5% per year, but starting in 2007 several large increases were seen. From 2005 to 2015 the average cash rent increased 86%, or a compound annual growth rate of 6.1%. This took them from $126 per acre to $229 per acre today. The historical record also shows that rents can decline steadily as well. From their 1981 peak of $106 per acre, rents declined by 32% by 1987. To put that decline in perspective, it took 15 years for rents to reach the $100 per acre mark again. The forecast of more substantial cash rent declines that we mentioned earlier, would certainly be large relative to many of the previous declines. However, would a decline of that magnitude be enough to restore profitability? To look at rent relative to expected profitability we calculated the expected return to farmland from the Purdue crop budgets. The return to farmland is the residual that would be available after all of the farmers other expenses are paid. In other words, if the budgeted return to farmland were equal to cash rent, then the farmer would expect to exactly pay all of his/her expenses (including full machinery costs and family labor) and end with zero economic profits. In figure 2 we show budgeted cash rent (blue) and the expected return to farmland (red). It is pretty clear that an 8% decline in cash rent alone would not restore profitability. Figure 2. 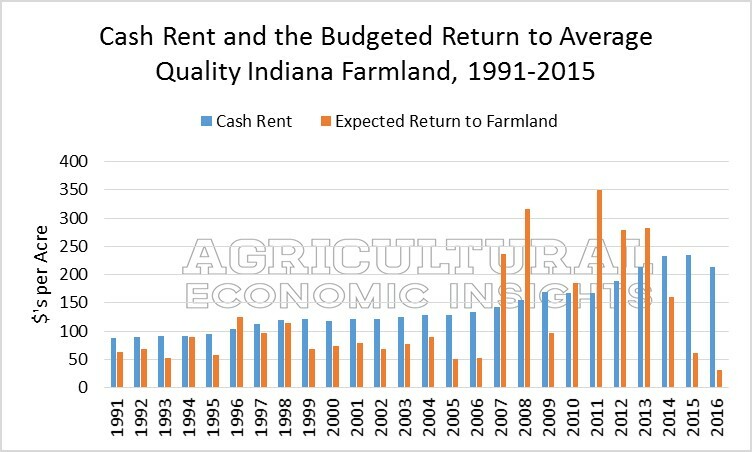 Cash Rent and Budgeted Return to Average Quality Indiana Farmland, 1991-2015. Source: Purdue Crop Budgets, ID-166. The figure shows that cash rents frequently (73% of the time) exceed the expected return to farmland. In other words, farmers often start the year with a small budgeted loss. You will also notice that starting in 2007 the opposite situation occurred. At that time the budgeted returns to farmland were much greater than cash rents. This was the case for 6 of the 7 years from 2007 to 2013 and is why rents rose sharply. Now the situation has reversed. In 2015 and 2016, the budgeted returns to farmland were $180 and $170 per acre short of cash rents. Just as the previous situation put upward pressure on land rents, this should provide continued pressure on farmland rents to fall. Another way to look at this same data is to calculate the ratio of budgeted return to farmland to cash rents. In other words, the percent of cash rent that is covered in the initial budget. A value of 100% would indicate economic profits and a value less than 100% economic losses. This is shown in figure 3. The graph makes pretty clear that the difference between the budgeted return to farmland and cash rents is at an extreme level. For 2015, the budgeted return to farmland covered only 26% of cash rents and declined to only 14% in 2016. Prior to these years, the lowest value of this ratio was 40% (2005 and 2006). If commodity prices remain at levels similar to budgeted levels, rents will likely continue to trend lower. Figure 3. Budgeted Return to Average Quality Indiana Farmland as a Percent of Cash Rent, 1991-2016. The rapid increase and then decrease in farm profitability challenged farmers and landowners alike to come to agreement on cash rents. While farm income shot quickly upward, rents did not immediately follow. Similarly, as profits have fallen, rents have not fallen immediately. There are many possible explanations for this phenomenon, but it is likely arises from a combination of factors. Many rental agreements span multiple years. This makes adjustment to changing economic conditions slower than if the agreements were negotiated every year. While longer term rental agreements tend to slow the adjustment process, they also have benefits. Fixing rents for a longer period of time has the benefit of reducing the amount of time and effort spent renegotiating rents. Longer term rents also provide the benefit of stability to the farming operation and the landowner. Related to this, farmland rental decisions impact the farming operation in multiple ways. Making major changes to the number of acres rented impacts the need for resources such as equipment, labor, and operating capital required by the farming operation. Some of inputs, but particularly equipment and labor, are difficult to adjust in the short term and making adjustments can have longer-term strategic implications. If a farm gears up to farm more acres, it often requires adding equipment and/or labor, both of which are expensive and difficult to adjust. This means that farmers have an incentive to try and keep land to match the equipment and labor inputs that they have secured for the farm operation, even if renting means that they only make a partial contribution to fixed costs. Longer term relationships benefit the landowner when they find a tenant that keeps the farm in good condition, maintains (or improves) the quality of the land, and reduces the searching cost of finding new tenants. Farmland rental agreements are made under great uncertainty. It is very difficult to know how economic conditions might evolve over the course of the lease agreement, even if it is only a year. Given that rental expenses are the single largest input on a farm, in a down trending market parties are reluctant to overbid for farmland knowing that a bad decision can greatly impact profitability. On the other hand, when there is reason to be optimistic about future profitability, the fear of missing out on higher farm incomes can lead to very aggressive bidding and asking prices for farmland. Recent data indicate that cash rents are heading lower. 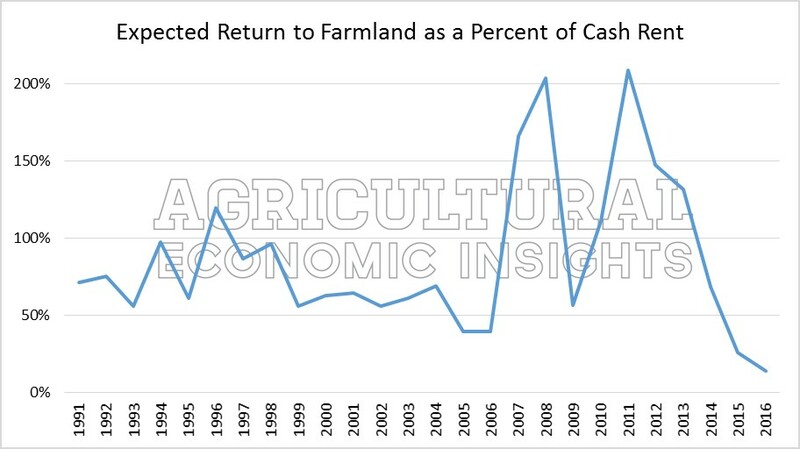 This is not surprising as the current returns to farmland are very low relative to cash rents. Unless revenues improve (rather substantially), it is quite likely that land rents will continue to come under pressure.